Starting at 36" diameter up to 56" diameter means there is a fan available for most applications. 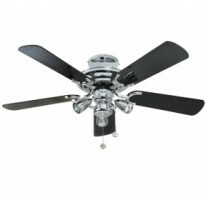 With a huge number of designs and blade options we can select a fan to fit with all design styles. Options of with or without lights, local or remote control,flush or drop rod mounted means the fan can be selected to suite you precise needs. Fantasia fans offer extended guarantee in some cases up to 15 years to give peace of mind when it comes to life, stability, noise and performance. We are here to help you make the right selection. Call us or chat on-line.